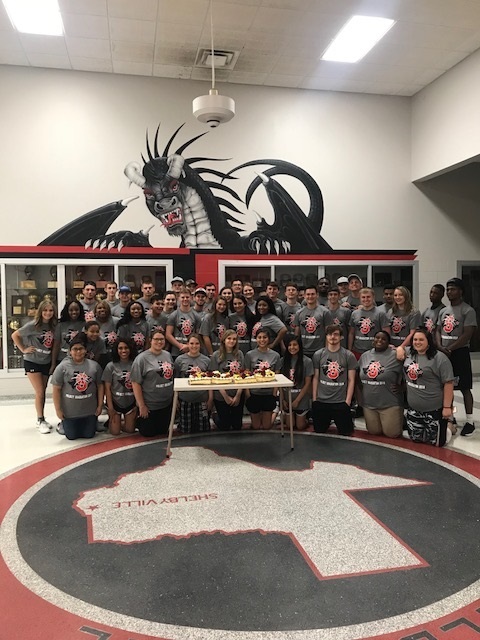 June 4, 2018- Tenaha ISD Summer Lunch Program begins. Monday – Thursday. Breakfast 7:30 am and Lunch 11:30 am. Program Ends June 28th. Shelbyville ISD would like to thank all the sponsors of project graduation. Panola College Library Gallery to exhibit "100 Books to Read in a Lifetime"
The M.P. Baker Library of Panola College will feature “100 Books to Read in a Lifetime” from June 2, 2018-August 1, 2018. The list of books is comprised of recommendations from three prominent sources. The first is Goodreads, the world’s largest free site for readers and book recommendations since 2007. The second is the title list suggested by Amazon’s book editors. The third is the suggested list of titles provided by local readers here in Panola County. Interactive components allow visitor feedback and offers suggestions for reading material. Featured in the exhibit is a compilation of 20th century classics, novels, adult fiction, nonfiction, children’s and young adult books that span multiple genres. Join us in discovering what others are reading and have found significant enough to suggest the selections to others. Tenaha ISD held their annual teacher and staff awards on May 25th . Each year Tenaha ISD celebrates excellence in education by awarding teachers and staff for going above and beyond what is required. Each award given is named for a person that truly had an impact on the Tenaha ISD community and was an inspiration to all. All Panola paperwork must be turned in by Wednesday, June 6, 2018, before 3:00 to the high school office. This includes Dual Credit Enrollment Form, TSI Results, and Meningitis Shot Records. Tenaha ISD now has online registration! Parents will be required to complete all student registrations online. Tenaha ISD will be there every step of the way providing technical support to parents in need. Early Online Registration begins today! 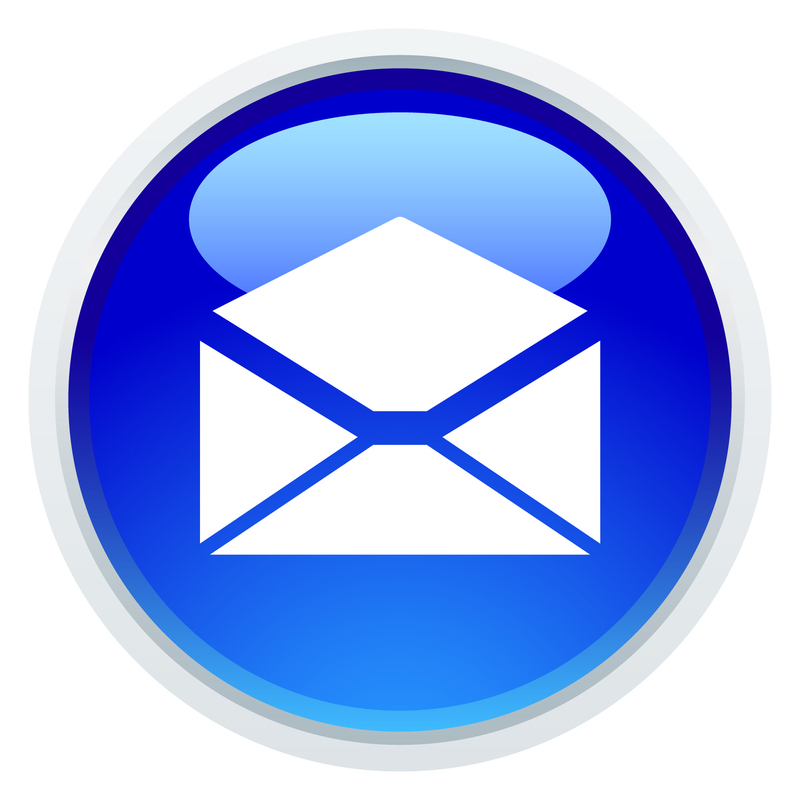 You can register online from home if you have an active Parent Portal account. After successfully registering your student(s) print documents that require your signature, sign and submit documents to the Tenaha High School office. If you require assistance or you do not have a parent portal account or you need to use a computer please come to Tenaha ISD Elementary office from 9-11:30am and 1:30-3:00pm and we will have staff on hand to assist. 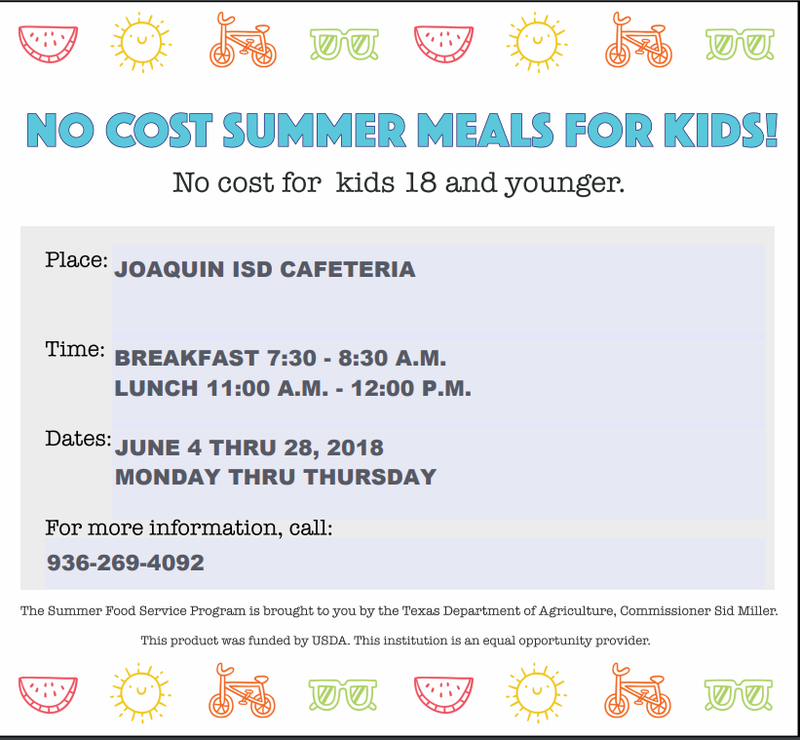 Please contact Regina Tovar at 936-248-5000 ext. 301 for more information. Parents may register new and transfer students beginning today! Come by the Tenaha Elementary Office to complete online registration. Please bring social security card, immunization record, birth certificate, and parent identification. Bryan is the son of Alicia and Rodolfo Solorzano. His favorite subjects are math and reading. Bryan is a leader among his classmates. He is friendly and always does his best. Bryan enjoys playing games. Miriam is the daughter of Jose’ Flores and Alicia Espinoza. Her favorite subject is math and reading. Miriam is such a joy to work with. She is a hard worker and a good friend to her classmates. Destiny is the daughter of Kendall and Misty Cotten. Her favorite subject is reading. Destiny always has her work turned in and ready to start a new task. She is very well behaved and respectful to her teachers and friends. In her spare time she likes to ride her horses, play basketball and softball. Emily is the daughter of Kasey Hargrove and Robbie Chambliss. Her favorite subject is math. Emily is an outgoing student that excels in math and band. She loves to draw and hang out with her friends. Jeremy is the son of Kristy Norris. His favorite subject is math. Jeremy basketball football track. He loves to play sports and hopes to someday play college football or basketball. He spends his spare time studying and spends time with family and friends. Drew is the daughter of Shellie and Jamie Henry. Her favorite subject is math. She is actively involved in BETA, JCC, Robotics and Band. After high school her plans are to attend A & M University and become a surgical veterinarian. Jaron is the son of Karen Roland. His favorite subject is Spanish 2 because he loves to speak Spanish. He is an active member of the band and water boy for football and basketball. After high school he plans to travel to Mexico because he could use his Spanish language there. He would also like to go to Florida and visit Disney World again. Christian is the son of Carla Ashton. He has participated in football, baseball, and track. He has earned multiple awards in football. His plans after graduation are to attend Panola Junior College and pursue a career in welding. Multiple awards were handed out the last day of school for Tenaha Elementary. Students were recognized for their hard work through out the school year. Earning recognition in band were, left to right, Ana Valencia-Chevez Director’s Award, Juan Vega Most Improved, Lilliuanna Horton Outstanding Percussion, Jaydaleeya Curtis Outstanding Woodwin, and Sophie Hughes Outstanding Brass. Pictured above: (left to right) Tristan Mendez, Bryson Richey, and Kaidynce Polley. Front row: (left to right) D’Kayden Moore, Michael Loredo-Torres, and Eli Bush. Back row: (left to right) Jaya Johnson, Bryce Fountain, Jocelyn Aquilar, and Nancy Flores. Front row: (left to right) Anaya Walker, Kimberly Tovar, Verranza Mendez, Emily Hernandez, Stephen Garrett, Ramon Flores, Cameron Fleming, and J’Hase Scourton. Back row: (left to right) Connon Warr, Kianna Norris, Matthew Gatlin, Elsa Flores, Jasmine Clifton, Kendilyn Bell, and Malcolm Williams. Left to right: Aidan Tyner, Bryson Richey, Kaidynce Polley, Jaelyn Pecina, Tristan Mendez, and Vanidy Briseno. Left to right: Michael Loredo Torres, Jaya Johnson, Nancy Flores, Jocelyn Aquilar, and Jason Flores. From left to right: Jaydaleeya Curtis, Jairo Hernandez, Briana Jackson, and Yelitza Perez. Front row: (left to right) Farris Warr, Blayze Hurst, Isabella Perales, Keila Perez Lumbreras, Jocelyn Gonzalez, Ky’ron Giles, Julian Corpus, and Dayra Flores. Back row: (left to right) Gisel Vazquez, Kiauri Richardson, Te’Ajhza Landon, Ta’Laysia Kelly, and Dalli Hall. Front row: (left to right) Fallon Thomas, Julian Fountain, Evelyn Galvan, Eli Bush, and Miriam Flores Espinoza. Back row: (left to right) Cameron Shofner, Sophia Watson, Carter Duncan, and Christian Lewis, and Mar’Keriyah Davis. Front row: (left to right) Matthew Gatlin, Malcom Williams, Cameron Fleming, Verranza Mendez, and Kimberly Tovar. Back row: (left to right) Anaya Walker, Jonathan Ramirez, and Elsa Flores. Front row: (left to right) Jesus Rico, Cade Sims, and Brooklyn Swann. Middle row: (left to right) Arron Plata, Decaden Cooks, Eddie Berona, Macee Henry, and Kaleb Wagstaff. Back row: (left to right) Alondra Gonzales, Keegan Cotten, and Ty’Kyriana Barnes. Front row: (left to right) Juan Vega, Jayden Beatriz, Christopher Suell, and Jiaro Hernandez. Back row: (left to right) Chezni Dominguez, Yuliana Perez, Tatyana Adams, and Lilliuanna Horton. Front row: (left to right) Jael Sandaval , Jordan Wilson, Madelin Rogue, Sirmarion Evans, Kason Dominguez, and Evan Orozco. Back row: (left to right) Seydi Colin-Gomez, Aidyn Thomas, Hadley Sims, Korbyn Fontenot, Gracie Hicks, and Caitlyn Cassell. The Citizenship Award was presented by David Jeter to Nancy Flores. Front row: (left to right) Alandra Gonzales, Evelyn Galvan, Bryce Fountain, Owen Tercero, Gisel Vasquez, and Cade Sims. Back row: (left to right) Jairo Hernandez, Anaya Walker, Raymon Flores, and Jaydaleeya Curtis. Front row: (left to right) Kendyll Cato, ILove George, Jace Estes, Moses Caballero, Kenzley Hurst, Evelyn Aguilar, Hadley Sims, and John Jones. Back row: (left to right) Michael Laredo, David Laredo, Waylon George, Evelyn Galvan, Jakorrious Miles, D’Kayden Moore, Christian Lewis, Miriam Flores, Joselynn Aguilar, Jason Flores, Damian Escalante, and Julia Beatrice. Front row: (left to right) Madelin Rogue, Kason Dominguez, Kendyll Cato, Gracie Hicks, Tuff Belrose, and Jace Estes. Back row: (left to right) Aidyn Thomas, Korbyn Fontenot, Caitlyn Cassell, Trinity Berry, Kamryn Fontenot, and Evan Orozco. Front row: (left to right) Alondra Gonzales, Kaleb Wagstaff, Ramon Flores, Isabella Perales, and Kyron Giles. Back row: (left to right) Jaydaleeya Curtis, Kendilyn Bell, Christian Lewis, Gisel Vazquez, and Jairo Hernandez. Front row: (left to right) Tristan Mendez, Aidan Tyner, Kimberly Tovar, Jaelyn Pecina, and Emely Hernandez. Middle Row: (left to right) Michael Santana, Cameron Shofner, Jonathan Ramirez, Nancy Flores, and Bryson Richey. Back row: (left to right) Kianna Norris, and Jocelyn Aguilar. Front row: (left to right) Ezequel Martinez, Jayden Beatriz, Cade Sims, and Adrian Ramirez. Back row: (left to right) Jairo Hernandez, Brianna Jackson, and Lilliuanna Horton. Front row: (left to right) Aaron Plata, Cade Sims, Eddie Barona, Jonathan Ramirez, and Ezequel Martinez. Back row: (left to right) Macee Henry, Diana Flores, Jaydaleeya Curtis, and Jairo Hernandez. On May 23, 2018, the Tenaha Middle School Band traveled to Canton High School where they performed at the Sound Post Music Festival. All three judges gave the band a division one rating! The judges had many great comments and constructive criticisms that will guide our band to the next level! The Tenaha High School Band, 7th grade band, and now the 6th/7th combined band have all earn the highest rating possible this semester. 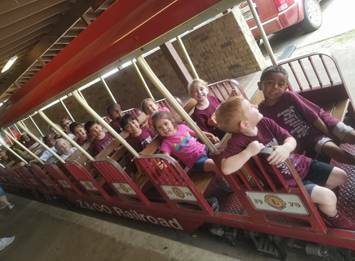 These students enjoyed a much deserved trip to Splash Kingdom following their first-rate performance. TENAHA ISD ONLINE REGISTRATION TO BEGIN SOON! Tenaha ISD will be using online registration for current Tenaha students, new Tenaha students and transfer students. No longer will parents fill out the paper version registration packet! ALL REGISTRATION WILL NOW BE COMPLETED ON LINE! Online registration will open May 29th. Parents may complete registration online (internet required) or they may come to the school and use designated computers where school personnel will be on hand to assist parents with online registration May 29th, May 30th and May 31st. New transfers enrollment will begin May 29th through May 31st at Tenaha ISD. All new transfers must enroll in person. New transfers will be required to complete online enrollment. If you missed PK and Kindergarten Round Up you can still come by the school to register your child. If you have any questions regarding Online Registration please contact Regina Tovar at 936-248-5000 ext 301. The Tenaha Senior class of 2019 will host a summer basketball camp. Where: Tenaha Tiger Gym..Ages:5-10 Time 9 am-12 pm. Ages:11-15 Time 2 pm-5 pm. 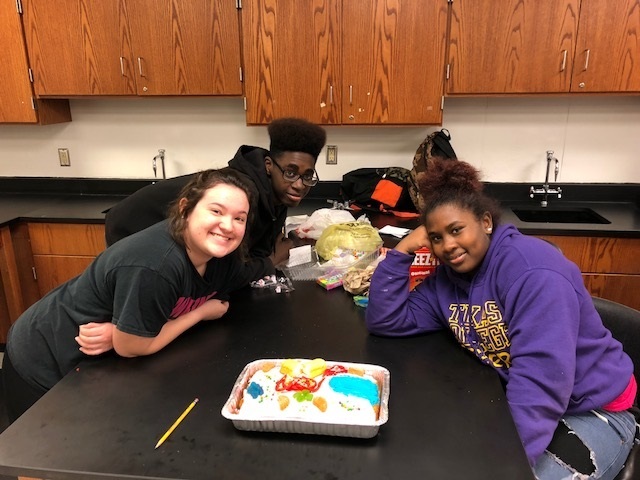 Biology News – Mrs. Teresa Jourden reports that the Biology classes created their own cells this week! Students were able to identify the organelles that make up the cell and know that each organelle has a specific function that is required to help maintain balance within the system. Timpson ISD Construction Progressing - Timpson Independent School District is proud to announce that our new Collegiate Center and Activity Center is nearing completion. The new structure is a prime example of the direction our district is headed. Timpson ISD is proud of the success we have had with our Bear Football Team, Bear Band, Ag Program and the strong academic foundation our students have had over the past century. The new facility ties in the old with the new which is exactly what the vision is for our district academically. Timpson High School, Timpson Middle School and Timpson Elementary will always be. However, a school district which is stagnant is falling behind, so Timpson ISD will remain progressive and intentionally try to stay in front of the educational curve and movement. Timpson ISD is committed to be progressive educationally, however we will always remain rich in tradition. The new structure is a visual reminder of this platform as it reflects a band of red brick, consistent with the red brick of our beloved Timpson High School building, but yet two lighter toned brick patterns used as an impression of a bright future ahead. The traditional red brick is a prime example of Timpson ISD being proud and respectful of our past but also blending the old with the new. Timpson ISD would like to thank our community for all of its support and encourage everyone to come up and visit our district. It has always been a great time to be a BEAR!! 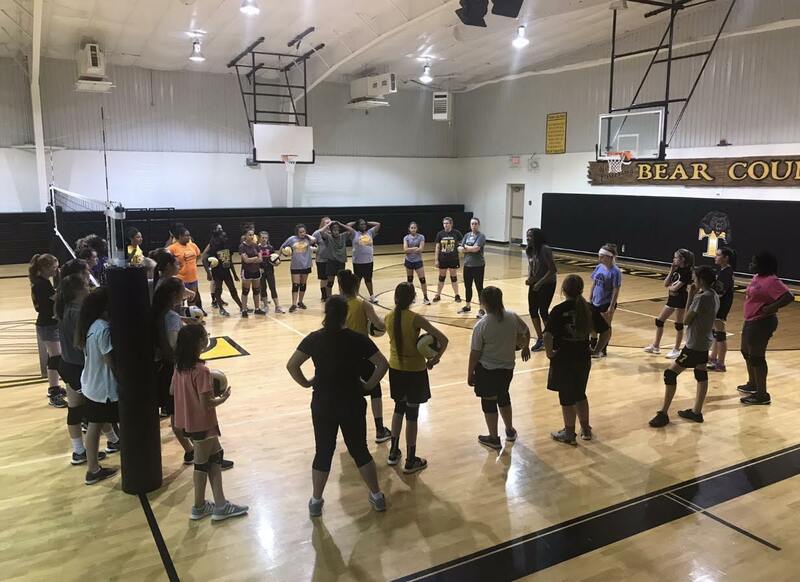 Tuesday night, TLB Volleyball hosted Panola College Head Volleyball Coach Amber McCray and Assistant Coach Jane Hays in a 3 hour volleyball clinic. An astounding 37 players attended the clinic! TLB were put through a series of drills consisting of ball control, setting, hitting, defensive skills, and offensive skills. I'm extremely proud of the girls for their time, effort, and desire to get better. 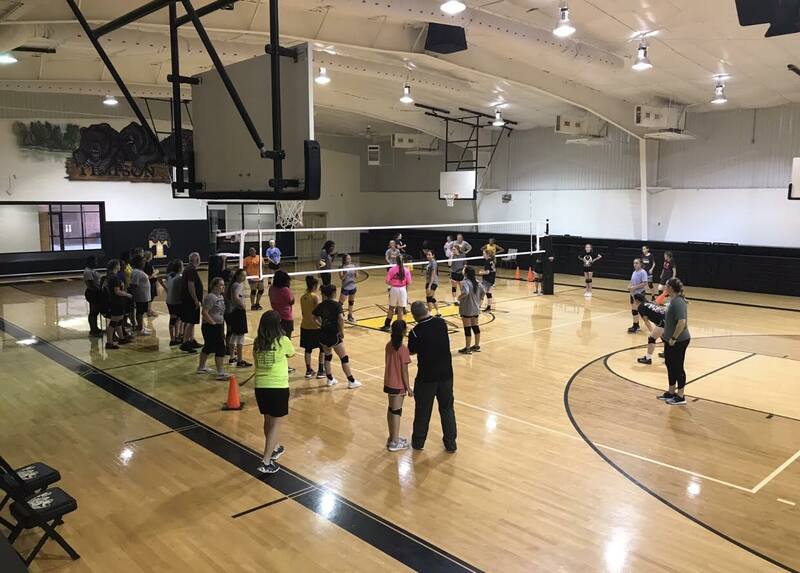 TLB Volleyball will be playing in the Varsity and JV divisions of the East Texas Summer League starting May 30th. I'm proud that we have 19 girls signed up!!!! We will have 2-3 matches per night. I would like to thank the parents for their continued support of TLB Volleyball. I realize playing during the summer requires a lot of time, energy and sacrifice from all involved. Dates and places are listed below, and we are still waiting on game times. Many faculty members, relatives, friends, and community members packed the JHS auditorium in order to show their support of the Class of 2018. Numerous scholarships were given to the seniors, in order to help them continue their post-secondary education. Joaquin High School 2018 Valedictorian is Joshua Spencer Hamilton, son of Jeffery and Alicia Hamilton. Committed to his studies in mathematics and science, Joshua is an active member of the Texas High School Rodeo in Region V Steer Wrestling and Roping Team. Academically, he challenges himself with a rigorous course load, including taking college classes at Panola College. Joshua has played football for the RAMS, participating in BETA club, UIL Science and Math, and has been a class officer for the three years. 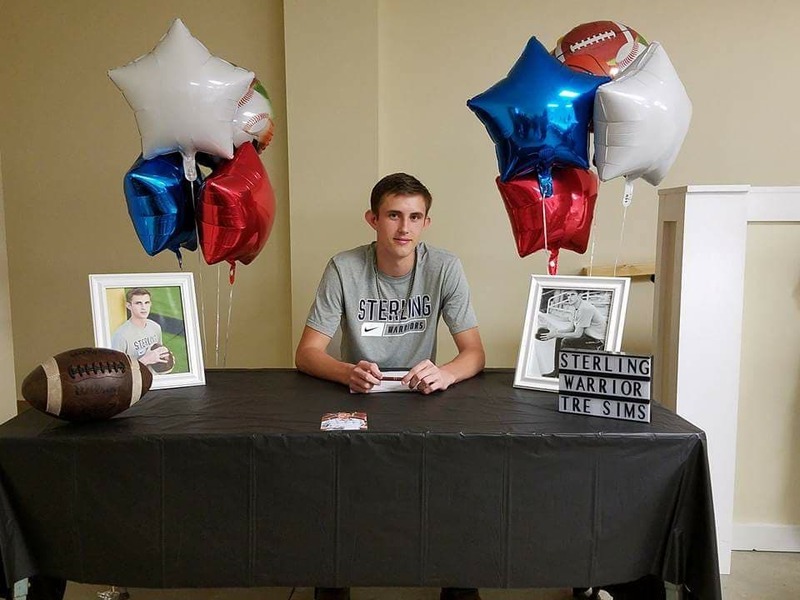 Joshua plans to attend Stephen F. Austin State University in the fall, majoring in Biology. After attaining a Bachelor’s Degree in Chemistry, he will apply to Pharmacy School. Joaquin High School 2018 Salutatorian is Brock Hughes, son of Brad and Melanie Hughes. Brock is not only committed to his high-achieving academics at school and Panola College, but also to his extracurricular activities and volunteer work. An active member of the BETA Club and Junior Chamber of Commerce, he has collected can food, clothing and toys for the community. He has been an active volunteer at the local festivals, Little League games, and escorted the reigning queen in the Poultry Festival Pageant. Brock has represented his class and various clubs as an officer. After graduation, Brock plans to attend Texas A&M University, pursuing a degree in Biology and continuing his education in Dental School. May 17, 2018-STARR G8 Social Studies; Senior Trip to Destin FL Leaving at 6 am Sharp! The deadline is Thursday, June 28th at 4:00 p.m. for applications to be considered for the 2018-2019 school year. 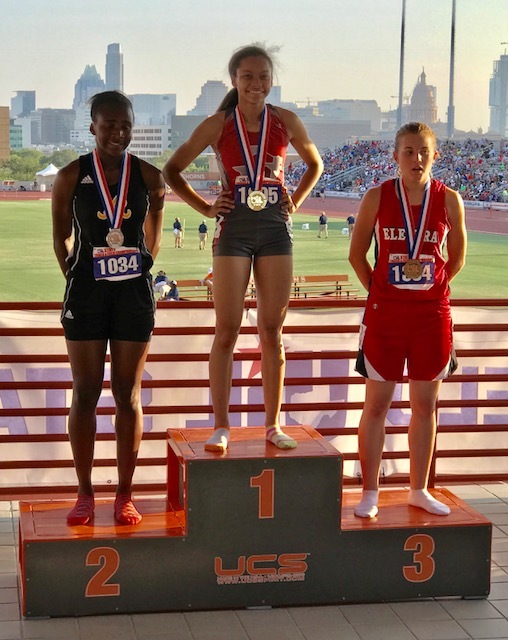 Shelbyville High School Senior Keanna Osby won the State Championship this weekend in Austin in both the 800M and the 400M Dash! She holds the School Record in both races with a 56:56 in the 400 meter and a 2:18 in the 800 meter. Congratulations Keke!! Thursday, May 17, 2018 @ 8:00 a.m., Senior, Mildred "Millie" Medina will sign a letter of intent to play soccer for Paris Junior College for the next 2 years as a starting forward. The CHS Athletic Department along with the CHS Library will be hosting this event. (May 11, 2018 ) -- Notice is hereby given that in accordance with 34CFR 300.573, Joaquin Independent School District intends to destroy the records of all students who have not had any recorded action with Joaquin I.S.D. Special Education at the end of five (5) years. Any student, or former student, who has reached 18 years of age, may review and/or receive these records by contacting the Special Education Department at (936)269-3258 X 239 and scheduling an appointment by July 30, 2018. Destruction of these records will begin August 30, 2018. According to federal law, parents and guardians lose their right to review or obtain these records when their child (the student) reaches 18 years of age or starts attending a postsecondary institution, whichever occurs first. However, a parent of a child with a disability who is 18 years of age or older may retain parental rights provided that the child has been determined to be legally incompetent or legally incapacitated. Upon review, a copy of any information contained in the record will be provided to the parent/guardian or eligible student. Ariday Hernandez is the daughter of Gregorio and Maria Hernandez. High school extracurricular activities include soccer, tennis, cross country, BETA, JCC, and band. Honors and awards include Texas State Solo and Ensemble Contest qualifier, 2 years; Outstanding Woodwind, 3 years; and the soccer team captain, 1 year. Upon graduating high school she plans to attend Panola Junior College. Ariday plans to pursue a career in occupational therapy. Tavoris Giles Jr. is the son of Lanieca Williams and Tavoris Giles. His extracurricular activities during high school include football, basketball, baseball, BETA, FFA, and JCC. Honors and awards include State Finalist, 1 year, football; All-State Linebacker, 1 year, football; District Defensive MVP, 1 year, football; District 2nd Team Linebacker, 1 year, football; TSWA All-State Linebacker, football; 2017 Padilla Poll Coaches All-State Defensive Player of the Year, football; 2017 District First Team Tight End, football; Regional Finalists, 2 years, basketball; 2nd Team Catcher, 1 year, baseball; BETA Pledge Captain, 1 year; Voted by high school student body: Most Likely to Succeed; Best Dressed; and Beauty and Brains. After graduating high school his plans are to attend the University of Houston. He is going to pursue a career in kinesiology. Elizabeth Hernandez is the daughter of Raul and Angelica Hernandez. High school extracurricular activities include soccer, cross country, BETA, and JCC. Honors and awards include three time Regional Qualifier in cross country and All A Honor Roll, 2 years. After graduating high school Elizabeth plans include attending Panola Junior College and pursuing a career in occupational therapy. Christian Ashton is the son of Carla Ashton. High school extracurricular activities include football, baseball, and track. Honors and awards include State Finalist, football; All State linebacker, 2 years, football; and All District linebacker, 3 year, football. He will be graduating high school with a certification in welding from Panola Junior College. His plans after graduation are to attend Panola Junior College and pursue a career in welding. Maria Balladares is the daughter of Jose Balladares and Maglori Lopez. After graduating high school her plans are to attend Panola Junior College. She is going to pursue a career as a massage therapist. Janiya Brock is the daughter of the late Katina Brock. Upon graduating high school her plans are to attend Prairie View College. She would like to pursue a career in nursing. Shawn Cheshire is the son of Vicki Benson. His extracurricular activities include playing football. Honors and awards include All District Offensive Lineman, 1 year, football; and State Finalist, 1 year, football. He will be graduating with a certification in welding from Panola Junior College. Shawn is going to pursue a career in welding. Sydney Diane Cheshire is the granddaughter of Kathy and Mitchell Holloway. Her extracurricular activities include soccer, tennis, cross country track and BETA. Her plans after graduation are to attend Angelina College. Her plans are to pursue a career as a sonogram technician. TyMaryon Davis is the daughter of Annette Bratchett and Nicholas Davis. Her extracurricular activities include basketball, track, tennis, Tiger Dolls and band. She will be graduating high school with a certification in Medical Billing & Coding. Upon graduating high school she plans to attend Panola Junior College. Her plans are to pursue a career in nursing. Bianca Davison is the daughter of Garry and Mistie Davison. Her extracurricular activities include basketball, track, BETA, robotics, and cheerleading. Honors and awards include First Team All District, 2 years, basketball; District Co-MVP, 1 year, basketball; TABC All-Region, 3 years, basketball; Regional Finalist, 3 years, basketball; State Qualifier, robotics, 3 years; BETA Secretary, 1 year; Regional Qualifier, track, 1 year; Regional Finalist, track, 1 year; Area Qualifier, track, 2 years. After graduating high school Bianca plans to attend East Texas Baptist University. Her plans are to pursue a career in chemistry. Alan Flores is the son of Roberto and Ana Flores. Extracurricular activities include cross country, track, tennis, band, and soccer. Honors and awards include Regional Qualifier in cross country for 2 years. After graduating high school his plans are to attend Panola Junior College. He will pursue a career in industrial technology. Matthew Flournoy is the son of Kenneth and Cheryl Flournoy. His extracurricular activities include football and the fishing team. Honors and awards include Second Team All District Left Guard, 2 years, football; First Team all District Left Tackle, football; and Second Team All State, football. Matthew will be graduating high school with a certification in welding. After graduating high school his plans are to attend Panola Junior College. He plans to pursue a career as a welding inspector. Cody Lane Foshee is the son of Jennifer Hass and Ronnie Foshee. Extracurricular activities include football, basketball and baseball. Honors and awards include State Finalist, football, 1 year; Honorable Mention, football, 1 year; Honorable Mention, baseball, 1 year; and 2nd Team All District, 2 years, basketball. After graduating high school his plans are to attend Panola Junior College. Cody would like to pursue a career in the nursing field. Lucas Fox is the son of Stacey and Amanda Fox. His extracurricular activities include the Tenaha High School Fishing Team. Upon graduation Lucas plans to pursue a career in the oil field. JaChristopher Gardner is the grandson of Mary McCollister, and son of Katoria Giles. His extracurricular activities include football, basketball and track. Honor and awards include All State basketball, two years; All Region basketball, three years; All State Football, two years; and Track State Finalist, 2 years. 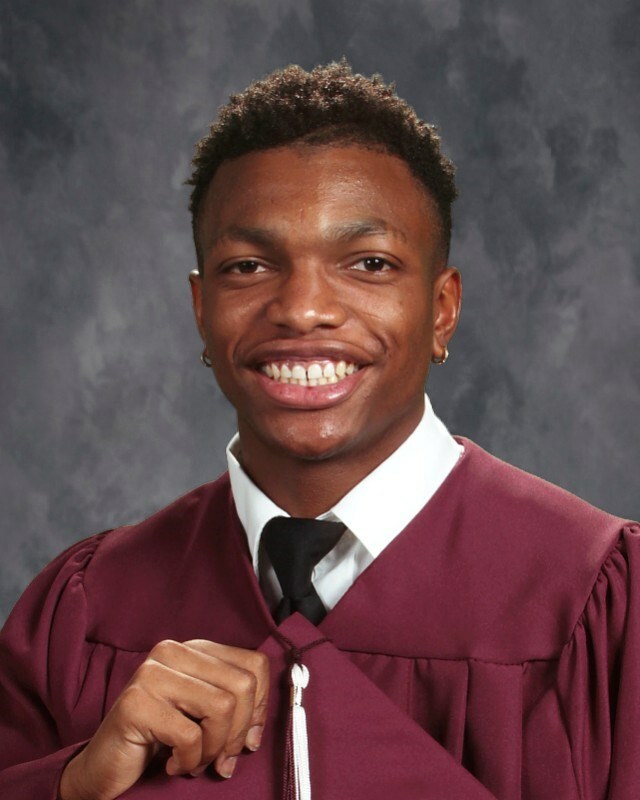 Upon graduating high school he plans to attend Trinity Valley Community College. He is going to pursue a career in kinesiology. LaDarrius Garrett is the son of Tony and Sonya Garrett. Extracurricular activities include football, basketball, band, BETA and JCC. Awards and honors include State Finalists, 1 year, football; State Semi-Finalist, 1 year, football; Quarter Finalists, 2 years, football; Regional Finalist, 4 years, basketball; First Team All District Running Back, football; First Team All County Running Back, football; and Regional Qualifier, 1 year, track; and voted by his classmates as Teacher’s Pet and Most Competitive. After graduating high school his plans are to attend Prairie View A & M University. LaDarrius plans to pursue a career in accounting. Cadettric Gray is the son of Nikki Gray. After graduating high school his plans are to attend Panola Junior College. Cadettric’s plans are to pursue a career in construction. Antawon Harris is the son of Jessie Lee and Lulu Cooks. His extracurricular activities include football. Awards and honors include Honorable Mention Football, 2 years. After graduating high school he plans to attend Panola Junior College. He is going to pursue a career in occupational therapy or physical therapy. Hernan Hernandez is the son of Margarito Hernandez and Sofi Perez. Extracurricular activities include football, soccer, tennis, BETA , band, and JCC. Honors and awards include State Qualifier, solo and ensemble, 2 years, band; State Qualifier, football, 1 year; and New Summer Field All Tournament, soccer, 1 year. After graduating high school his plans are to attend Panola Junior College. Hernan plans to pursue a career in nursing. Ruben Hernandez is the son of Leonel Hernandez and Juana Aguilar. Extracurricular activities include football, soccer, band, robotics and BETA. Honors and awards include Robotics 1st Place, area competition; Robotics 1st Place, Region VII competition; State Solo and Ensemble Qualifier, 3 years, band; 2016 State Soloist , band; Honorable Mention, 1 year, football; 2017 State Qualifier in football; Outstanding Sophomore, band; and Outstanding Brass, 2 years, band. After graduating high school his plans are to attend Panola Junior College. His plans are to pursue a career in nursing. Zayda Hernandez is the daughter of Juan and Catalina Hernandez. Extracurricular activities include soccer, cross country, band and track. After graduating high school she plans to attend Panola Junior College. She is going to pursue a career as a dental assistant. Altus Craig Horn is the son of Craig and Alicia Horn and Kim Carpenter. Extracurricular activities include football, basketball and baseball. Awards and honors include 2016 and 2017 Built Ford Tough Player of the Week; 2017 Built Ford Tough Player of the Year; 2015 District MVP, football; 2016-2017 Co-District MVP, football; 2016 and 2017 All State, football; 2014 All District Wide Receiver; 2014 District Newcomer of the Year; and 2017 Dairy Queen Player of the Week. After graduating high school his plans are to attend Howard Payne University. His plans are to pursue a career in nursing. Zania Hubbard is the daughter of Lynett Cartwright and Detoris Hubbard. Extracurricular activities include FFA for two years. She will be graduating high school with a certification as a Certified Nurse Aide. After graduating high school she plans to attend Panola Junior College. She is going to pursue a career in the medical field. Colton Hutto is the son of Cindy and Chad Hutto. Extracurricular activities include the fishing team. He will be graduating high school with a certification in Welding. He is going to pursue a career in welding. Bailey Lampley is the son of Larry Paul and Cheyenne Lampley. Extracurricular activities include the fishing team. His plans after graduation are to pursue a career as a railroad engineer. Holly Elizabeth Linebarger is the daughter of Matthew and Elizabeth Linebarger. Extracurricular activities include FFA, four years. She will be graduating with a certification as a Certified Nurse Aide. After graduating high school her plans are to attend Panola Junior College. Her plans are to pursue a career in the medical field. Joselin Lopez is the daughter of Jose and Isabel Ovozco. Extracurricular activities include soccer and track. She will be graduating high school with a certification in Medical Billing and Coding. After graduating high school she plans to attend Panola Junior College. She is going to pursue a career in health and nursing field. Josie Martinez is the daughter of Martin and Marcie Olalde. Her plans after graduating high school are to attend Panola Junior College. Josie plans to pursue a career in occupational therapy. Crystal McDonald is the daughter of Jason and Michelle McDonald. Extracurricular activities include soccer and BETA. She will be graduating with a certification as a Certified Nurse Aide. Her plans are to pursue a career in nursing. Miguel Mendoza is the son of Miguel Mendoza and Marisol Segura. Extracurricular activities include football, baseball, cross country, BETA, band and soccer. Honors and awards include JV District Champion, 1 year, cross country; State Finalist, football; and State Solo and Ensemble, 2 years, band. After graduating high school his plans are to attend Panola Junior College. He is going to pursue a career in general business. Selena Mendoza is the daughter of Manuel Mendoza and Daria Sanchez. Extracurricular activities include soccer, track, cross country, band and Tiger Dolls. Honors and awards include cross country Regional Qualifier, two years. She will be graduating high school with a certification in Medical Billing and Coding. After graduating high school she plans to attend Panola Junior College. She is going to pursue a career as an occupational therapist assistant. Ariel Patterson is the daughter of Tim and Rhonda Patterson. Extracurricular activities include FFA and high school mascot. After graduating high school her plans are to attend Panola Junior College. She is going to pursue a career in cosmetology. Caniya Reed is the daughter of Chiquita and Keitha Reed. Extracurricular activities include basketball, band and Tiger Dolls. She will be graduating high school with a certification as a Certified Nurse Aide. After graduating high school she plans to attend Panola Junior College. She is going to pursue a career in nursing. Alex Rodriguez is the son of Maria Escalante and Jesus Flores. Extracurricular activities include soccer, cross country, and band. Honors and awards include District Champs in cross country. After graduating high school he plans to attend Panola Junior College. His plans are to pursue a career in computer technology. Arlicia Roland is the daughter of Aaron and Catrice Roland. Extracurricular activities include basketball, tennis, cheerleading, band, BETA, and JCC. Honors and Awards include MVP, 3 years, basketball; Offensive Player of the Year, 1 year, basketball; TABC All-Region Team, basketball, 4 years; Regional Qualifier, 3 years, track; Girls’ Doubles District Champ, 1 year, tennis; Regional Qualifier, 3 years, tennis; Regional Quarter Finalists, 1 year, tennis; Drum Major, 1 year, band; JCC Vice President, 1 year; Class President, 3 years; Most Athletic, 3 years; Class Clown, 4 years; Most School Spirit, 2 years; Most Competitive, 2 years; and 2017 Homecoming Queen. After graduating high school her plans are to attend Stephen F. Austin State University. Arlicia is going to pursue a career in nursing. Calicia Roland is the daughter of Aaron and Catrice Roland. Extracurricular activities include basketball, tennis, track, band, cheerleader, BETA, robotics and JCC. Honors and Awards include Second Team All District, 2 years, basketball, Honorable Mention, 1 year, basketball, Defensive MVP, 1 year, basketball, Regional Qualifier, 2 years, track, District Champ, 1 year, tennis, Regional Qualifier, 3 years, tennis, Regional Quarter Finalists, 1 year, tennis; BETA Club secretary, 2 years; BETA Club Vice President, 1 year; BETA Club Treasurer, 1 year; Class Vice President, 4 years; JCC Secretary, 1 year; voted Most Competitive by her classmates, 1 year; voted Clumsiest Girl by her classmates, 1 year; Athletic Sweetheart, 1 year; A and B Honor Roll, 3 years; and All A Honor Roll, 1 year. After graduating high school Calicia plans to attend Stephen F. Austin State University. Her plans are to pursue a career in nursing. Merlid Sandoval is the daughter of Ciro and Angelica Sandoval. Extracurricular activities include band, BETA , FFA, yearbook, and robotics. After graduating high school her plans are to attend Panola Junior College. She is going to pursue a career in criminal justice. Narce Servin is the daughter of Jose and Filomena Servin. After graduating high school she plans to attend Panola Junior College. She plans to pursue a career in cosmetology. Alexis Shires is the daughter of Steven Shires and Dawn Sellers. Extracurricular activities include basketball, track, JCC, FFA, cheerleader and BETA. Honors and awards include regional qualifier, basketball; JCC Sweetheart, 2 years; class officer, secretary, 4 years; and voted Class Favorite by her classmates, 2 years. She will attend Texas Tech University after graduating high school. Her future plans are to become an optometrist. Jordan Thompson is the son of Ricky and Sherry Thompson and Karen Thompson. Extracurricular activities include football and power lifting. Honors and awards include First Team All District, football; First Team Running Back, football; State Qualifier, power lifting. After graduating high school his plans are to attend Texas State Technical College. He plans to pursue a career in the oil field. Onterio Thompson is the son of Craig and Alicia Horn. Extracurricular activities include football. Honors and awards include All-State football, All- District football, and MVP in football. He will be graduating high school with a certification in welding. He is going to pursue a career in welding. Yailin Torres is the daughter of Julian Torres and Lucila Alvarez. Extracurricular activities include soccer. 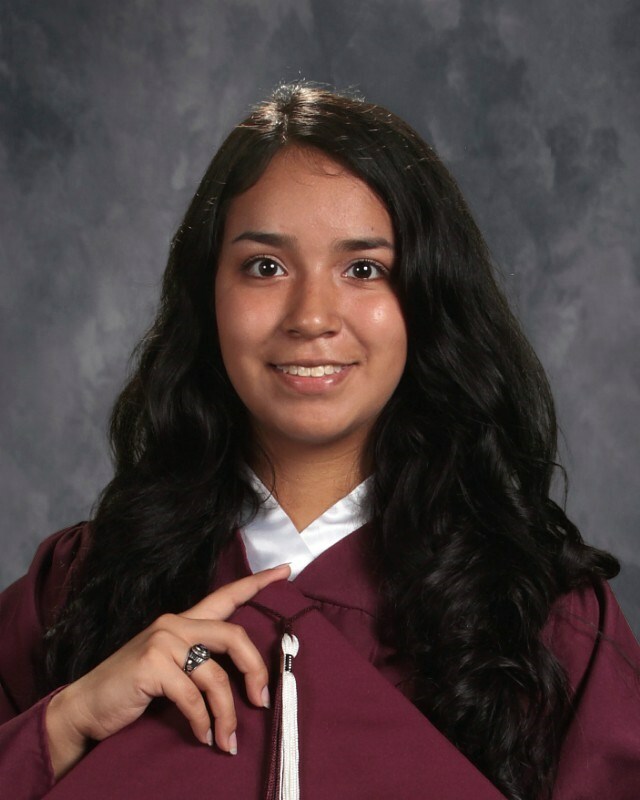 After graduating high school she plans to attend Tarrant County College in Arlington, Texas. She is going to pursue a career in criminal justice or photography. Jordi Velazquez is the son of Jorge and Yolanda Velazquez. Extracurricular activities include soccer. After graduating high school he plans to attend Panola Junior College. He is going to pursue a career in the Oil field. Jaden Washington is the daughter of Frank and Angel Washington. Extracurricular activities include basketball, track, JCC, cheerleader, robotics, and BETA. Honors and awards include three time Regional Qualifier in track; Second Team All District, 2 years, basketball; BETA president, 2 years; BETA Pledge Captain, 1 year; JCC Secretary, 1 year; JCC President, 1 year; 2016 Homecoming Queen; voted Class Favorite by her classmates; Miss THS; voted Most Likely to be Famous, Most Talented and Best Dressed by her classmates; and 2018 Prom Queen. 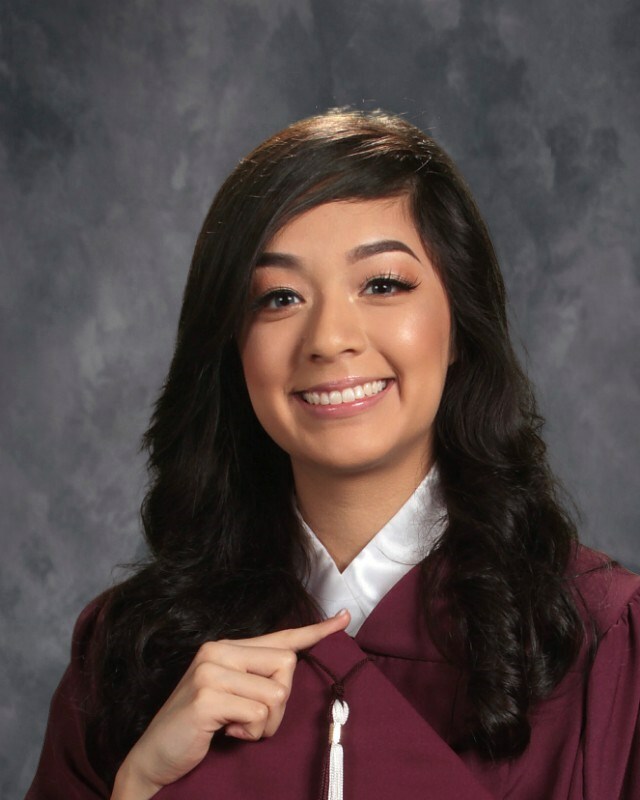 After graduating high school she plans to attend Stephen F. Austin State University. She is going to pursue a career in communications. Destini Whitehead is the daughter of Marcus and Christina Whitehead. Extracurricular activities include basketball, track and BETA. Honors and Awards include National Honor Society; Who’s Who; 2015 Defensive Player of the Year, basketball; 2016 5A MVP, basketball; All Region, 3 years, basketball; All East Texas, 4 years, basketball; All State, 2 years, basketball; 2018 2A MVP, basketball; and nominee for 2018 All American McDonald’s All Star, basketball. After graduating high school she plans to attend Sam Houston State University where she has been awarded a basketball scholarship. She is going to pursue a career in Nursing. Martrovian Williams is the son of Farah Williams. Extracurricular activities include Band. Honors and awards include State Finalist in Solo and Ensemble in band. After graduating high school he plans to attend Panola Junior College. His future plans are to pursue a career in music. 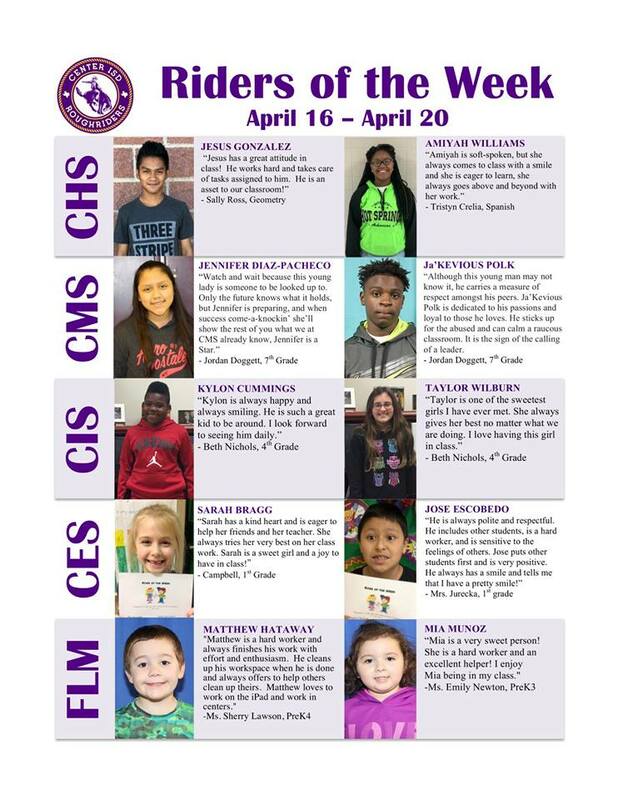 Your child will be taking the State of Texas Assessments of Academic Readiness or STAAR test on Monday, May 14th (3rd /4th grade Math and 5th grade Math retakes), Tuesday, May 15th ( 3rd/4th grade Reading and 5th grade Reading retakes), and Wednesday, May 16th (5th Grade Science). This is a high stakes test. Third and fourth grade students must pass the test in order to avoid attending summer school. All fifth graders must pass the math and reading tests in order to be promoted to the next grade level as well as to avoid attending summer school. Your child has worked very hard to master the objectives that will be measured on this test. We hope that you will encourage your child to do the very best he or she possibly can on the STAAR test. It is very important that your child gets a good night’s sleep before the test. Please make sure your child is in bed early so that he or she will be well rested. It is also important that your child eat a good breakfast on the morning of the test. Please make sure your child eats breakfast at home or at school on Monday, Tuesday, and Wednesday mornings. If your child is going to eat breakfast at school and you drop them off please make sure they are here by 7:20 a.m. Otherwise, please make sure your child is here by 7:45 a.m.
Only trained personnel are allowed in the building during testing. Parents will not be allowed in the building on Monday, Tuesday and Wednesday. Members of 'My Sister, Myself' at Center Middle School wish to thank the community for their donations during the recent roadblock. Thanks to your generosity, the girls and their sponsors have planned a weekend trip to Houston where they will be touring three universities. 'My Sister, Myself' is an organization created out of a need to see young girls empowered as future leaders of the community. Seniors received an order form for graduation pictures today. Seniors can purchase a picture package of them receiving their high school diploma. Mrs. Tyner has extra forms in room 30. Extras will also be available in high school office. Return orders to Mrs. Tyner. Thurs. May 10 – Elementary Awards Program – Gym @ 6:00 p.m. Sat. May 12 – State Track Meet – Good Luck - Nictaeo Scourton!! Shot putt!! Shelby County Poultry Festival Broiler entry time! – The price of the birds will be $30.00 for 30 birds. The 2018 Broiler Show and Sale will be held on October 6, 2018. We do not have a date for bird pick up yet - will let you know as soon as we do. If you would like your child to show broilers for the Timpson FFA Chapter contact Mrs. Powers or Mr. Harrison. Timpson Ag Building Phone Number (936) 558-4211 Forms and entry fee will be due by May 25th at the Timpson Ag Building. Forms can be picked up at the Timpson Ag Building or can be found at http://shelby.agrilife.org/ . 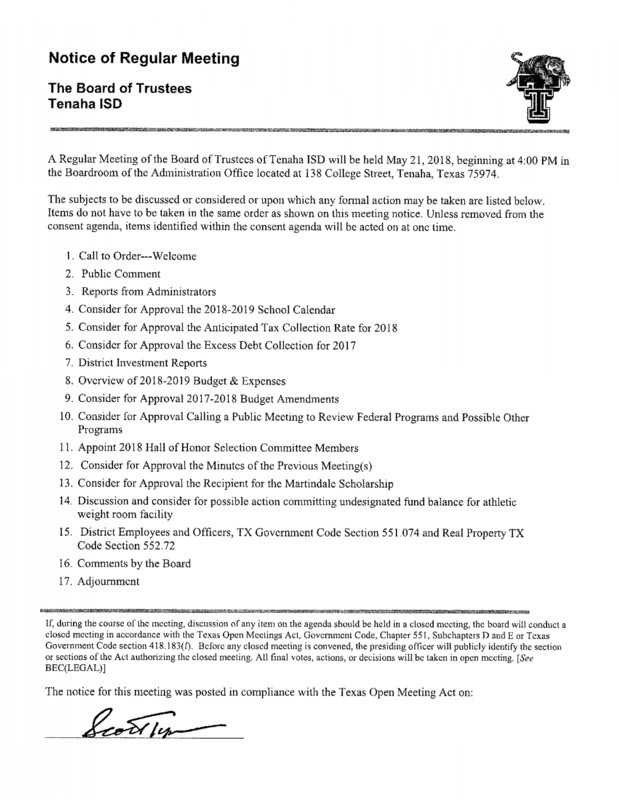 A Regular Meeting of the Board of Trustees of Center ISD will be held May 10, 2018, beginning at 12:00 PM in the Center Independent School District Administration Boardroom 107 PR 605 Center, TX 75935. The Joaquin Junior High Awards Ceremony will be Wednesday, May 9th at 8:30 am in the auditorium. To round out its theatrical season, the CHS Department of Theatre will present Center stage: An Evening of Music and Comedy at 6:30 pm on Monday, May 14. The show features the entire department -- first year students through fourth-year seniors -- in largely original material. The evening begins with an improv performance by "Elephants in the Room," the CHS comic improv troupe. They will be followed by the national qualifying comic duo of Keaton Watlington and Mark Perkins performing their Southern District Championship piece The Channel Six News, Now with 10% Less News. But the biggest part of the evening is the original sketch-musical developed by all five classes of the department: Back through the "Gateway" to the Future. It features every student in the department singing, dancing, and telling the story of five members of the the CHS class of 2018, set fifty years in the future. Through a clerical error, the five of them are required to enter high school again at age 68. They begin at freshman orientation and over the next four years, they end up changing the world. The show features original music and choreography, including original songs/arrangements by Tremoine Jackson, Keaton Watlington, and Ellie Walker. The evening concludes with departmental awards and a closing improvisation by the award winners. The 90 minute program is intended for all ages. The price of admission for the 6:30 production is $5 for adults and $3 for students. The newly elected Tenaha Cheerleaders for 2018-2019 School Year are from left to right, sitting in front, Paige Estes, Madison Hicks, Kamari Gray, Jonisha Thompson, Drew Henry, Azjha Glenn and Jaylynn Durbin. 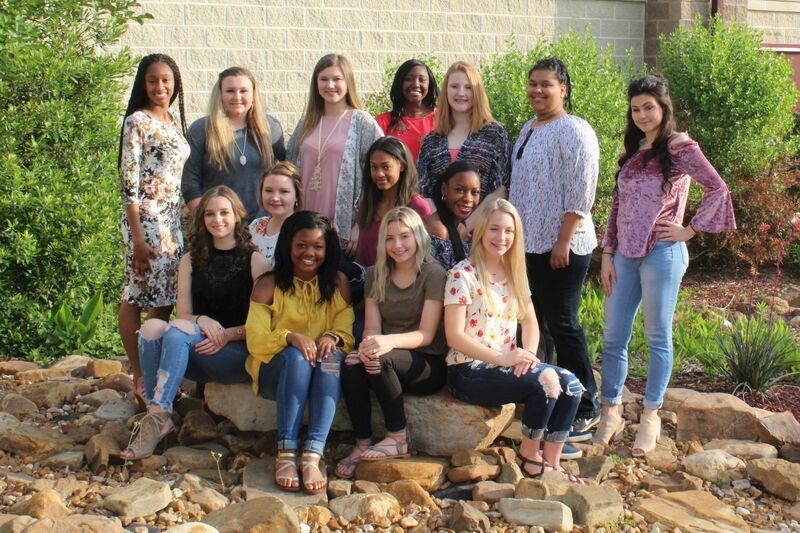 Back row standing left to right: Alexiaunna Gentry, Hannah Hicks, Olivia Ford, JyKeeria Patton, Addy Duncan, Kristin Rasberry, mascot, and Gracie Martinson. Center High School will host its annual scholarship awards program on Tuesday, May 8th. The program will be held in the high school gym and start at 6:00 p.m. Presenters are to meet in the high school library by 5:30 p.m.; seniors receiving an award are to report to the band hall by 5:30 p.m. Family, friends and community members are invited to attend. Reminder: Saturday, May 5th, the Tenaha Youth Center is hosting your “ Senior 2018 Celebration Party”, begins at 6:30 pm. 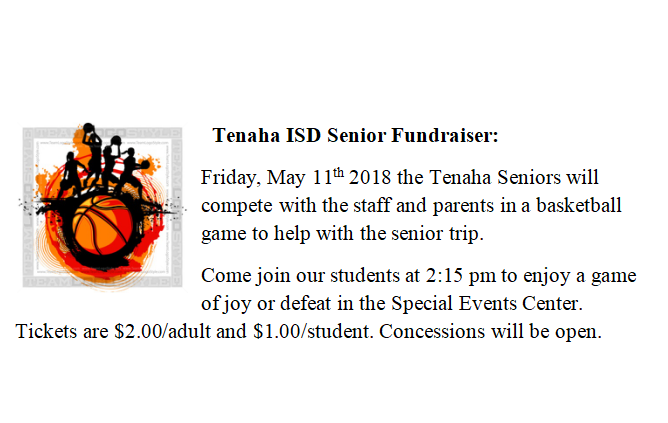 Friday, May 11th 2018 the Tenaha Seniors will compete with the staff and parents in a basketball game to help with the senior trip. Come join our students at 2:15 pm to enjoy a game of joy or defeat in the Special Events Center. Tickets are $2.00/adult and $1.00/student. Concessions will be open. The Tenaha Senior class will be selling smoked turkey legs Saturday, May 5th for $8 each & they will also be having a bake sale & car wash as welll. This event will be from 10am-3pm at the Tenaha High School! 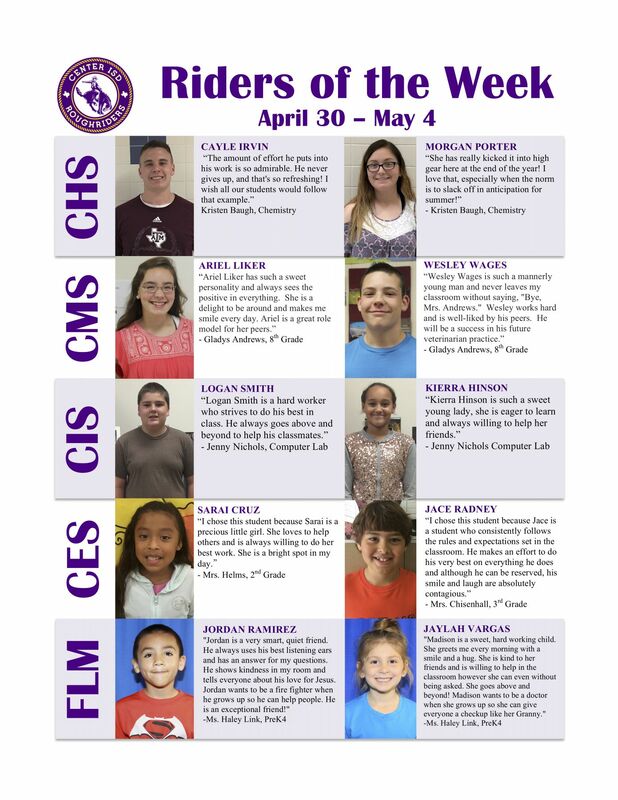 Elementary Honor Roll – See attached. Timpson FFA Banquet - Our annual FFA banquet is set for Thursday, May 10th at 6 pm at the Timpson Elementary Cafeteria. All faculty, staff, FFA members, Jr. FFA members and family members are invited to attend. Please come out to help us celebrate the AMAZING Timpson FFA members! The banquet is free to attend!! Thank you to all of the faculty, staff, Timpson community and, most importantly, Timpson parents of our FFA members! We hope to see you there! FCCLA News - Congratulations to the Family and Community Services class and FCCLA. 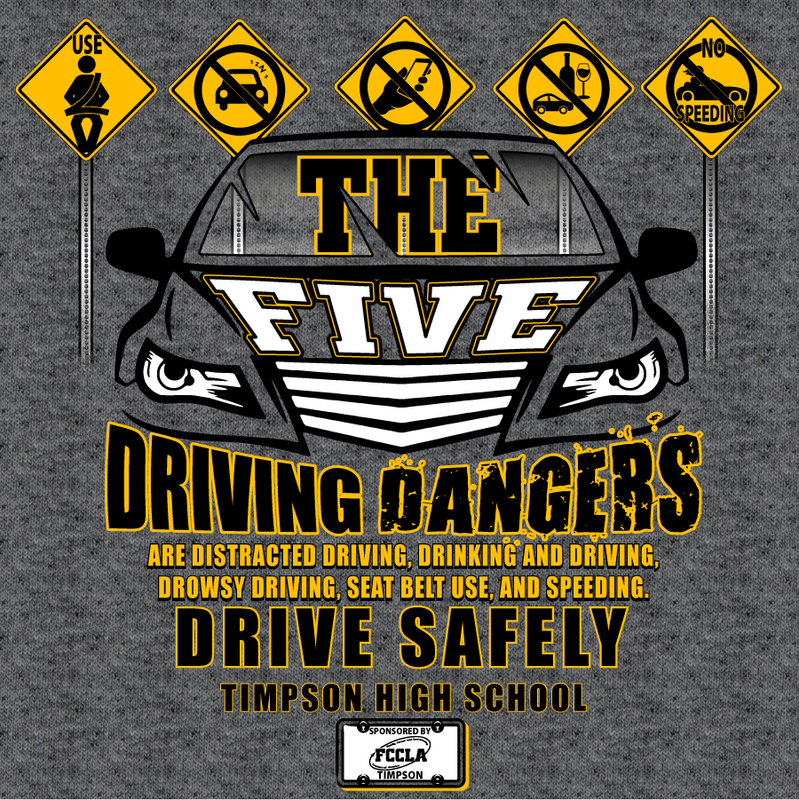 They were recognized at the high school awards program on Thursday, May 3 for earning 1st place in the Teens in the Driver Seat-TDS Cup Outstanding School contest. They received a check for $1000.00 that will be used to purchase each high school student a t-shirt with the TDS message printed on it. 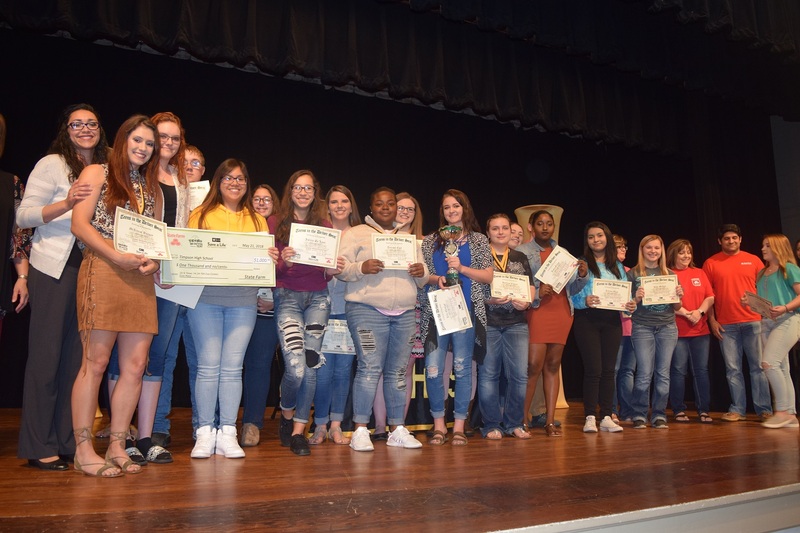 Team members include McKenzie Burgay, Katlynn Cox, Sandra Cuevas, Julieta De’Leon, Tyciuna Earl, Tela Etievant, Hannah Fabian, Kayla Green, Zach Jones, Autumn Lawhorn, Karina Meza, Hope Milford, Kristyn Rader, Karalyn Ramey, Samaria Richards, Allysha Stephens, Connor Timmons, Teresa Torres, and Kayleigh Wolf. 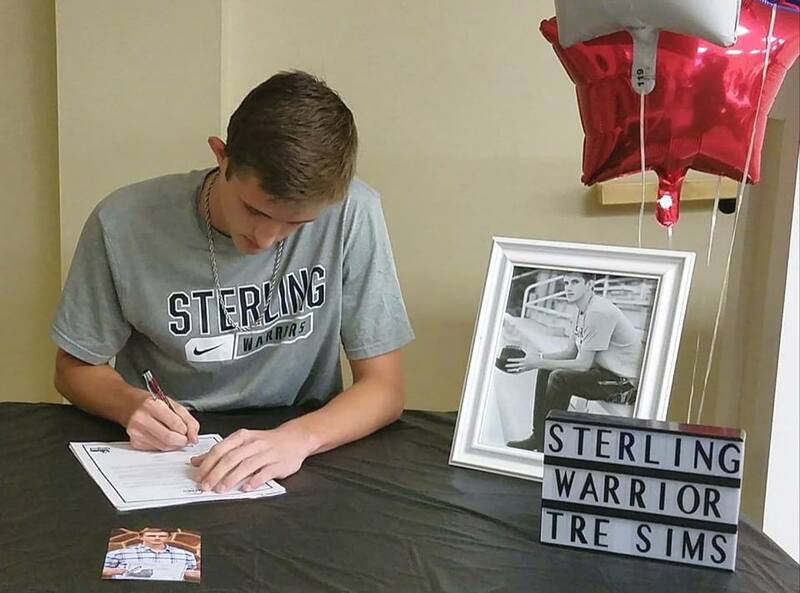 Tre Sims had his college signing at Shelbyville ISD earlier this week on Tuesday May 1st, 2018 to play for Sterling College in Kansas. Dragons vs Chireno at Chireno High School on May 3 @ 6:00 p.m. Game 2 will be in Shelbyville on May 4 @ 4:00 p.m. Game 3 will be played thirty minutes after game 2 if necessary. 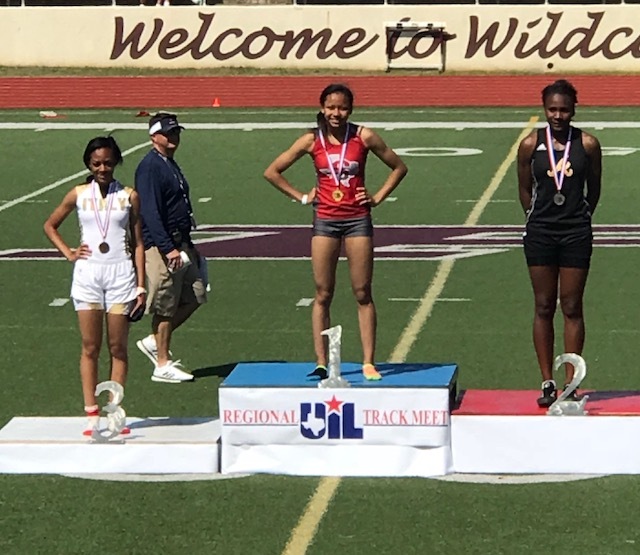 Shelbyville High School Senior, Keanna (Keke) Osby competed in the Conference 2A Region 3 Track Meet on April 27-28, 2018 in Palestine, TX . She is the Regional Champion in the 400M and the 800M! She has qualified for state four straight years, winning 2 Gold medals and 3 Silver medals. She will compete May 11-12, 2018 in the State Track Meet in Austin, TX. We are Dragon Proud! Softball News – The Timpson Lady Bears will be competing in Area play vs. Colmesneil on Thursday, May 3rd at Huntington at 6:00 p.m. Good luck Lady Bears!! Golf News - The Timpson Boys Golf team recently finished with a two day total score of 750 strokes to come in 4th place at the Regional 2A Golf Championships at Corsicana Country Club on Monday and Tuesday, April 23rd and 24th. The team was tied for third place after the first day of the tournament, shooting a score of 378. They improved on the second day with a score of 372, but it was 1 stroke short of an opportunity to go to the state tournament. Individually, Brock Behrens shot a 163, Dustin Pledger shot a 168, Gannen Braddock shot a 203, Kyle Bush shot a 216, and Jon Grogan shot a 242. Brock Behrens was able to qualify as an individual medalist for the state tournament with his score of 163. Athletic Banquet - The Timpson Athletic Banquet will be Monday, May 7 at 7:00 PM in the Good Hope Baptist Church Activity Center. Tickets are on sale in the high school office for $15. Tickets at the door will be $20. 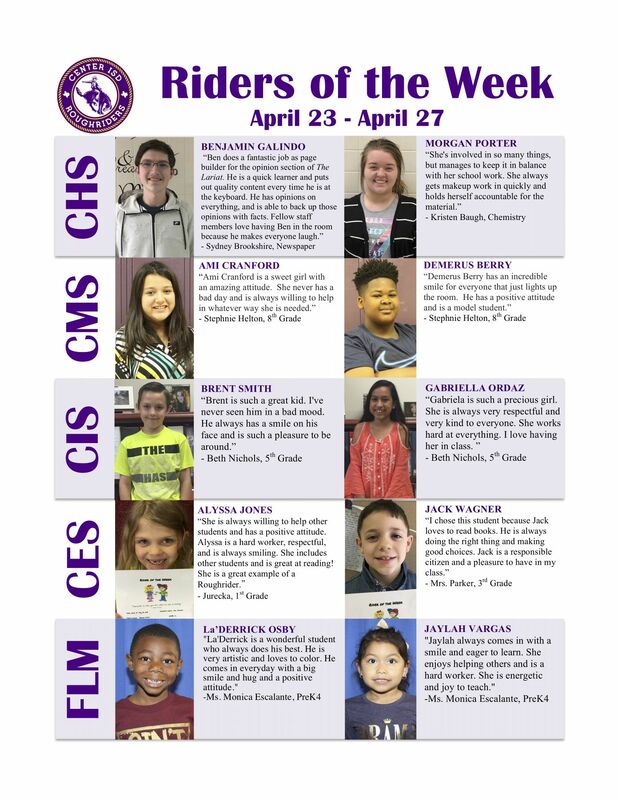 High School 5th 6 Weeks Honor Roll – See attached honor roll click here.